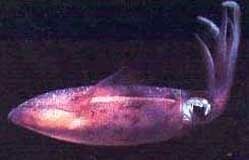 This squid is commonly seen in little schools hovering in mid water. May allow close approach with slow, non threatening movements. Size 6 to 12 inches.